If you buy the inline filter, (about $15) it will supposedly stop the clogging problem. 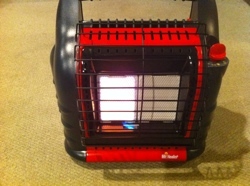 I just bought one of these heaters as a backup as well, I’m very impressed. I have been looking into getting one of these for a year or two, but haven’t yet sprung for it. I think this review has answered most of my questions. I was wondering, if anyone has used/heard any thoughts on the lil’ buddy or whatever the smaller verion of this heater is. There was an ad on craigslist for a big buddy and lil buddy both for $85 that I didn’t get but now wish I would have. I’m still looking for the best option if I was going to heat one or two rooms. Any thoughts would be great. I was also considering the little buddy. The reason I didn’t buy it is that at its max (9000 BTUs) it was slightly under what I needed. For one-room heating I’m sure it would be more than enough since I was able to heat my medium-sized room on only 4500 BTUs, but if you want it for two rooms, i would recommend springing for the larger Big Buddy. Just my 2 cents. P.S. The carbon monoxide detector is a great idea. Thanks for the prompt response. I had another question, did the one room get too hot and the other a little cold, or did you move the heater, or do you have enough circulation to make it uniform. I live pretty far North, and it gets cold here, so we have lots of blankets. I figure candles/lanterns will put out a little heat in each room so with blankets to bundle in, we won’t need a ton of heat. Propane isn’t a problem, just finding our which heating setup will be best, a few smaller ones or one big one small, etc. Thanks again. After testing just the one room I tried putting it in the hallway facing the two rooms I wanted heated. This did a pretty good job of heating both rooms to the mid to upper 60s (keep in mind that the heater was still on the lowest setting. I’m sure if I tried it on medium or high it would have been more than enough. Keep in mind that this is also radiant heat. So it helps to be facing the objects that you want warmed up. Even though it does have a blower fan, it’s most effective as a radiant heater. First, invest in the Big Buddy, not the smaller version. The difference in BTU output is enormous. Second, I would not get a “used” Big Buddy because the person who owned it may not have followed the correct procedures for proper care; namely, failure to shut off the propane tank (if you use a 20lb tank, which I highly recommend) BEFORE turning off the unit causes oil to build in the line, which will eventually be forced into the heater. This will cause damage which may not be obvious at first, but it will begin to stink and misfire, and the next stop is the trash can! You can pick up a new Big Buddy for under $80 if you search online, and have a little patience to get a deal. For example, Amazon was selling the Big Buddy for $129 just last week, but now has them for $77.99 as I write this. I searched for 2 weeks before finding the right deal, but it was well worth the time and wait. I bought mine from Grainger for $85, but they had a $30 rebate, so it only cost me $55 (a steal!). I purchased the 12′ hose (for 20lb tank hook-up) and line filter, too, which added $18 to the bill. And, I found an online purchase code at couponcabin.com (might have been retailmenot.com) for free shipping! Now for the best part – the Big Buddy packs a big bang for the buck! I use it to compliment my central heating. I have mine set on an 18″ x 24″ wood board (1/2″ thick) because the floor immediately in front of the heater gets really hot – not dangerously hot, but hot enough! The board extends about 12″ in front of the heater, which is all you need. Anyway, I have an open floor plan so the living room, kitchen, breakfast nook, and dining room are pretty much open to eachother, totaling 520sq feet of floor space. It wasn’t long after I got my Big Buddy that I came home after being away for a few days to a very cold house (54* degrees… I’m a southerner, so that’s bone chilling). It was probably about 35-40* outside. Normally, it would take at least 45-60 minutes to get the area up to 70* degrees in that situation with just central heating. I turned on the central heating and set the Big Buddy to “HIGH”, and in 22 minutes (yes, I timed it) the central heating thermastat read 70* degrees, and it turned off. Once I get the area up to 70* degrees, I turned the Big Buddy down to “MEDIUM” and that was it – toasty for the next 6 hours! If it’s more than 40-50* degrees outside, I will set it to “LOW” once I get the area up to 70* degrees, but “MEDIUM” if it’s colder than that. For those bitter cold evening I will crank it up to “HIGH” every once in a while for 15-20 minutes, and then turn it back down to “MEDIUM”. The central heating rarely ever turns on when I use this technique. Once, as an experiment when it was about 30* degrees outside, I left the Big Buddy on “HIGH” after getting the area up to 70*, and after 2 hours on “HIGH” it was 78* degrees in the living area. So, yeah, buying the Big Buddy was the best purchase I have ever made! Great comments and insights. I appreciate the detail and obvious research and testing you’ve done with your Big Buddy. I look forward to using this heater more often. I’m not sure why, but I cannot see the review, all I can see are the comments. Really want to read the review. Sorry about that Robert. I’m not sure what happened but the code got a bit garbled and erased the post. It should be all set now. As a rule I try to avoid using the larger tanks (20lb +) in my house. For that reason, I purchased the refill coupler sold by Mr. Heater, and it does the job of keeping the big tank out of the house because it’s used primarily as a fueling station. As such, I definitely recommend it. However I’m not completely turned off to the idea of using it indoors — especially if needed in an emergency. As for the tank hose with the regulator, Mr. Heater says that the filter is not needed since the PSI is lowered to the point where the chemical leeching of the hose does not occur. If you’re using any other type of hose, you’ll definitely need the filter. If you’d rather be absolutely sure that no contamination occurs, I would recommend getting and using both. Thanks for taking the time to reply to me, Much appreciated! I just wanted to make everyone aware that refilling 1lb. 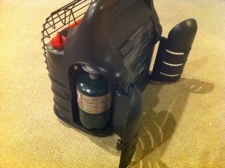 propane cylinders can be dangerous, and may be illegal (I know it is illegal to sell one that is refilled). I just wanted to let you guys know as an FYI, but not nanny state, brow beat, you! Thanks again for the review. I wish that I could relate. I live in South Texas and I am in a t shirt with the window open @ 10:00PM on Jan 27. It very well could hit the 90’s next month. When you find a good air-conditioning unit that uses propane (they used to exist, haven’t seen one in a while) please do a review on that! Yeah, I hate you right about now (especially since it took about 4 hours to clear my driveway yesterday of all the snow — and I used a big snowblower!). I just wanted to let your readers know that I placed a post on the tiny house blog about indoor air quality in tiny houses. 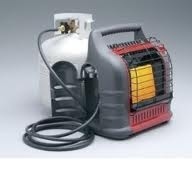 I discussed this type of heater. I have a lil’ buddy and it works well to keep pipes from freezing or one room warm. I would buy the hookup for the larger propane tank though. It is kind of a pain to keep changing out those little tanks. Agreed. I purchased the hookup and a fuel filter and it works great. 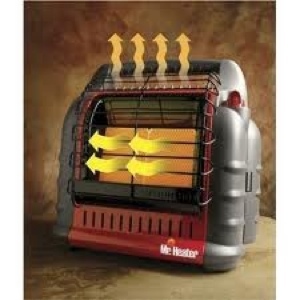 I recently purchased a Mr. Heater Big buddy. i am interested in purchasing a 20 lb. tank but i am not sure what i need to heeok it up. does any on have a part number or item number of what i will need. You’ll need the Mr. Heater Hose with Regulator. That’s what I purchased and it works great (you’ll need to buy two if you are hooking up two 20lb tanks). If you’re still looking for the Big Buddy Heater, this website offers one that meets US standards as well as one that meets Canadian standards. Not only does it have both heaters, the hose is also available. It’s a very extensive website, giving you the ability to also compare it with other heaters that serve the same function. Keep in mind that if you purchase the 12 ft. Mr. Heater hose with Regulator and Quick Disconnect coupling that not only will you not need the inline fuel filter but it is impossible to use it as the filter connection is threaded and the heater connection is a quick connect. I bought the Big Buddy on your recommendation just before a cold front hit a couple of weeks ago. I was freezing as I hooked up the tank and got it fired up. It didn’t take but a minute to realize this thing could save your life in the most dire conditions. It’s not cheap to run. I have been through 2-20 gal and 6 cans in 2 weeks but this has been my only source of heat and I have been warm running it on low most of the time. Kick this puppy on high and set it in the bathroom and you are good to go in 5 minutes. I just bought a 250 gal propane tank and will have it hooked up tomorrow or so. I will have my furnace back but my new Big Buddy is certainly going to vampire the big tank and save me money there. No more freezing on hunting trips, no more not working in the shop ’cause it’s too dang cold. I doubt you could carry it in but it would make you more friends than you could imagine at a cold high school football game. On the sidelines they should be mandatory. Ok, Ok, yeah I like the heater. I don’t know if it saved my life but it sure saved me a lot over hotels. 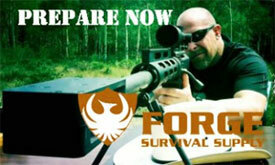 Great blog and website Erich. 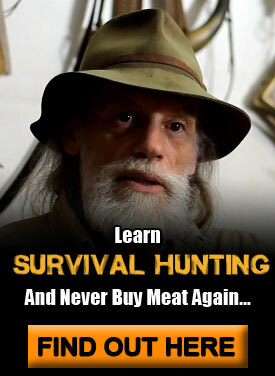 Thanks for the recommendation. Help! I am trying to run my mr bug buddy in a 23 foot rv. I bought a first alert fire alarm and it always goes off. I notice if I switch to low and reset the fire alarm (9 volt battery operated) out doesn’t. I do feel slightly head achy am I in danger? I thought these things were safe! !! Great discussion. Several years ago we had a 5-6 day power outage from ice storm. My elderly mother-in-law and handicapped daughter were sharing a two bedroom suite that also had a separate bathroom. I put a small 9000 BTU Buddy heater in the bathroom to heat the bathroom and two bedrooms. It ran continuously for 2 1/2 days on a 20lb tank. No odor, no headaches everyone felt fine. Checked on them twice a night. The bedrooms stayed about 66F while 32 or less outside. A real help. The main part of house we have wood furnace and generator when power goes out. Would highly recommend these heaters. Have a Big Buddy but have only tested it for a few minutes to be sure it works. 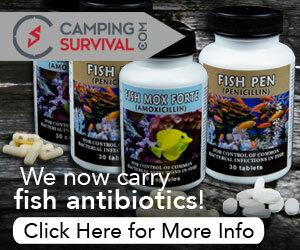 Would avoid placing in closed bedroom or tent or someplace that limited oxygen supply. Believe these heaters make CO when oxygen limited. Believe they now have oxygen sensor that turns them off if not enough O. If you want to read a great description of carbon monoxide poisoning read Richard Byrd– Alone at the South Pole. A good story in its own right. My husband and I are expedite drivers.. Our Espar Heater was in the Shop getting worked on. So we got a Mr Big Buddy to use.. I have been afraid as we know of them finding drivers dead in there Sprinter Vans before.. I have a c/o alarm crack the Windows. I start having weird dreams and getting woke up with migranes the alarm is going off at 218 .. Has anyone else had this trouble.. I am just glade to have the Expat back so I can Sleep.. Don’t think I can trust Mr Buddy.. I just ordered the Big Buddy heater for emergency heating. Initially I will use the 1 lb disposable propane tanks but would like the option to use 20lb tanks in the case of an extended power outage where I can’t use our generator This city/suburb girl is having trouble figuring out WHICH hose to get for that purpose. There are five options. Which hose did you purchase? Is it the quick connect that doesn’t need a filter? The easier the better as I’m not great with this sort of thing. Also, how doesn’t one vent to avoid CO2 poisoning? Is a cracked window enough? Thank you! I find nothing beats real live experience and appreciate your advice greatly. 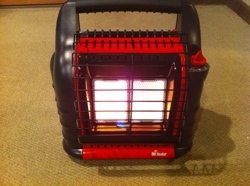 I’ve been using my Mr Buddy heater 6000 /12000 BTU for a couple of years in my RV, this year it will run for around five minutes and then the shut off happens.If not tipping over, what are other reasons for this? I have one of each of the Buddy Heaters, use them in my motor home. Spend all last winter yet Montana. Used the small one at the bathroom door, the medium by the front door. My motor home is an older 24′ unit and we were fine all winter. I did buy the large unit and it is super efficient. The large one on the low setting with a 30 lb tank will run for 5 days and nights. Medium setting for 4 days. I have used lil buddy for last month. Heat out in house and just the lil buddy has worked great. Easy to start … I find no problems. I did go out and purchase the big buddy … but for my purpose another lil buddy would have been fine. To get the higher output of the big buddy, you need to run two tanks either 1 # or 20#. I just have big buddy running from one 20# and it just about the same as lil buddy. I highly recommend both. I purchased a BIG BUDDY heater and a 30 lb tank to fuel it my problem is the regulator keeps freezing after a few minutes use. Please help!! We ahve had a big buddy for at least 20 years. We dont use it often but it has never failed us. At first we used to used it in a 30’+ trailer. Once in the winter when power went out at the house for several days the Big Buddy had no problem heating the kitchen and den. The family gathered in the den and slept on the couch and floor staying comfy warm. We are pretty rough on it. When not in use it sits in the shed, sometimes for years, collecting dust (need a cover for it) but when I pull it out and dust it off it fires right up no problem. I even forgot it had the built in fan. After 15 years the D batteries had started to leak so I replaced them and the little fan cranked right up. It would be nice if it had a bigger fan. We love our Heater Buddy. Does the Big Buddy heater require a separate gas supply for each burner ? As it has an arrangement for 2 one pound cylinders . One on each side. I would love to know how long the small tanks last in this heater. Thanks! ¿Question? When I run mine with the 20lb tank it always goes out when turned to high. If I add a 1lb tank to the other side it will burn on high until the 1lb is empty then go out….. Any advice? Mr. Heater Big Buddy Review | Welcome To….